'John Tognolini has been a rare voice and witness for justice in Australia, chronicling the struggles of Indigenous Australians and veterans and the deceptions of power from behind the facades of a society that prefers not to know. I salute him.' John Pilger, Veteran writer, journalist and filmmaker. ​A History Man’s Past & Other People’s Stories: A Shared Memoir. Part One: Other People’s Wars is John Tognolini’s fourth book published in 2015. In 2014 he had a blogging relationship with the Australian History Channel that had him writing articles for its World War One website H100. He’s produced four radio documentaries for ABC Radio National/RN: Bush Fires, Ups and Downs of Scaffolding, The Last Ship Built in the Dockyard [HMAS Success in Sydney’s Cockatoo Island Dockyard] and Underground about Lithgow Mine Rescue in the Western Coal fields. He’s also made three films No Blood For Oil on the 1990 Gulf War, The Occupation of Cockatoo Island Dockyard 1989, The Deregistration of the Builders Labourers Federation-the Victorian Story 1986-1992, the last two films are on Youtube. He’s also been involved in community radio since 1987 and the magazine Green Left Weekly since 1990 and has worked as a journalist for the ABC’s Radio’s Double J and Triple J. Before becoming a history teacher in 2000, he worked in a variety of blue collar jobs as a labourer, scaffolder, rigger, dogman, railway fettler, and painter and docker. ​In 2006 he set up the website Togs's Place.Com. The name Togs comes from the Cobb and Co way station,Togs’s Place, his Italian grandfather/nonno Antonio Tognolini and grandmother Annie, native born of an English convict and Irish migrant who both arrived in Hobart in the 1830’s. His grandparents used to work and live there with their 13 children, from the Victorian Gold Rush to it becoming the family farm in Yandoit in Central Victoria. He has a First Class Honours Degree in Communications from the University of Technology, Sydney and a Diploma of Secondary Education from the University of Western Sydney. He’s also been a marker for the NSW Higher School Certificate’s Ancient History Examination. He also completed the TAFE Certificate Two in Fire Fighting Operations and was a volunteer bush fire fighter for seventeen years. Originally from Melbourne’s Brunswick, he lived in Sydney and the Central Coast before moving to the Blue Mountain’s town of Katoomba in 1992 and was there for sixteen years before moving to Wellington in Central West, New South Wales in 2008. 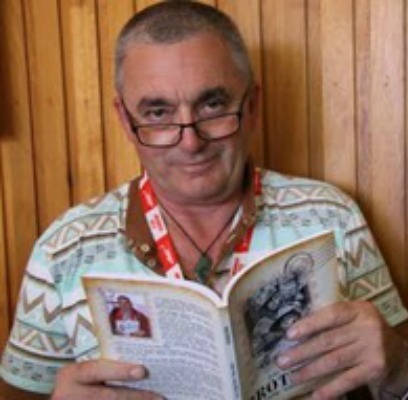 The Mountain City Murders, his first novel was published by Adelaide’s Ginninderra Press in 2010. 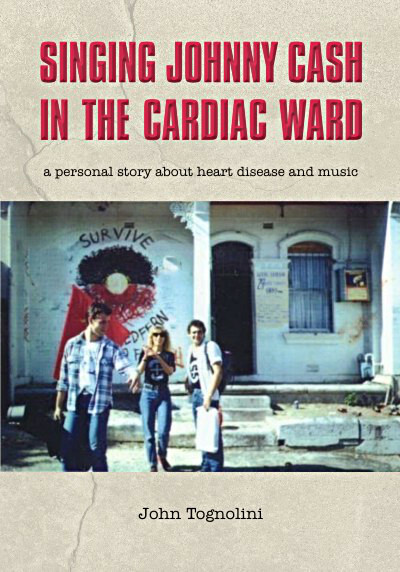 His autobiographical account of heart disease Singing Johnny Cash in Cardiac Ward, A Personal Story of Heart Disease and Music was published in 2013. His first historical novel Brothers Part One: Gallipoli 1915 was published in 2014. These three books have been translated into Chinese. All his books are available through WritersandEbooks as both paperbacks and ebooks. He is currently completing his historical novel series Brothers with the following three parts concentrating on the Western Front in France and Belgium from 1916 to 1918. He is also working on two more parts of his historical series, A History Man’s Past & Other Peoples’ Stories: A Shared Memoir. Part 2: What Is My Nation? History, Racism, Class, Justice & War and Part Three: Working People and Music. In late April 2016, he moved back to Katoomba and is on the New South Wales Teachers Federation’s State Council for the Blue Mountains and is secretary of the Blue Mountains Teachers Association. “The trouble with heart disease is that the first symptom is often hard to deal with − sudden death.”--Dr Michael Phelps. I should be brown bread. Translating that good Cockney rhyming slang, which has become part of the Australian vernacular, I should be dead. I say this because of my jam tart, my heart. Thanks to modern medical science I’m still here, and it’s been proved beyond all reasonable doubt that I have one, a heart that is. To use the football term, I’m in extra time. But instead of a few minutes, I’m talking about maybe three decades. I’m 54 years old. On October 28, 2011, I had a six-and-a-half hour heart operation. It was actually two operations, one to replace my aortic valve with a mechanical valve and one to graph my aortic artery (the main trunk from the heart that connects all the arteries). If I did not have these jobs done I would have been a dead man walking, the victim of a coronary aneurysm and certain heart failure ten months later. In writing this account I want to encourage people, especially men, to get their hearts checked out. There are many men who are not aware that they have a heart condition, let alone one that can kill them. There is a general reluctance among men to take our health issues seriously, not only in relation to the heart, but also other health issues that have a high fatality count, such as prostate cancer. As prostate cancer survivor and Hawthorn football legend Don Scott pointed out, men don’t take the same serious attitude to our health problems that women generally do. There’s an additional part of my story, explaining the fantastic healing power of music. This isn’t just a recounting of my journey of the heart, but also the story of my relationship with music. That relationship goes back more than twenty five years, alongside my involvement in radio. I’ve been fortunate enough to meet some great musicians over the years and a few have played a big role in my life. This isn’t just a descriptive account of my experience with heart disease, it’s also a serious attempt to help reduce the large death toll caused by it. Russell Crowe, Amanda Dole and myself outside Radio Redfern on May Day 1989. Russell had just performed a few songs on my show, Radio Solidarity. In 1988, Radio Skid Row was evicted from our studios in the basement floor of Sydney University’s Wenthworth Building. We were taken in for eighteen months by the Aborigines/Kooris at Radio Redfern, who now broadcast across Sydney through Koori Radio, until we built and opened the Radio Skid Row studios in Marrickville in 1990. Photo by Frances Kelly. The Mountain City Murders is a novel that can be described as Underbelly meets pub trivia with generous amounts of Shakespeare, Latin, satire and extreme violence involving murder and football training. It’s a roller coaster ride of a story involving not just murder but: corruption, drugs, misuse of police power, political protest, dissent and how not to run a pub in a small mountain tourist/commuter town called Mountain City. It’s also the story of Tree Changers who’ve escaped the rat race pace of Australia’s largest and most expensive city, Sydney to a find themselves in the habitat of a small community where everybody knows or knows of each other. It’s also a place where their past from Sydney can catch up with them, even from twenty years ago. This is a story of a property developer who wants to put Australia Salt Water Crocodiles in a place where it snows, 1,000 meters above sea level, and 2,000 kilometres south of their tropical environment and doesn’t see anything wrong with placing housing estates in known bushfire paths. He also has a low opinion of the local community that’s stopped McDonalds opening up five times. 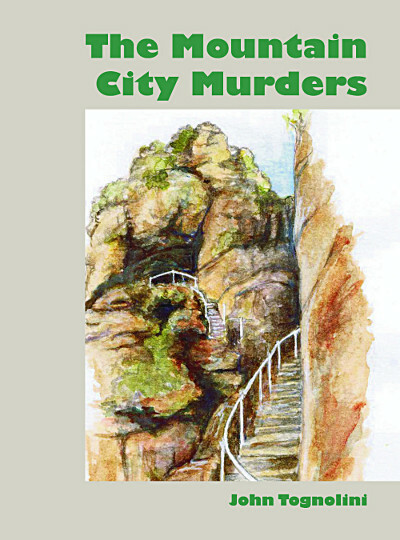 Mountain City Murders is also a story of the untouched bush and national parks around Mountain City: 200 meter high cliffs, temperate rainforests, mountain valleys, Swamp Necked Wallabies, Copper HeadSnakes, Owls and crime in a World Heritage Area. Mountain City Murders is a 21st Century Power Without Glory dedicated to the great Australian writer Frank Hardy. In Hardy’s classic Melbourne’s Collingwood is Caringbush and in Mountain City Murders, Mountain City is the Blue Mountains town of Katoomba and The Three Sisters are Tiddas Rocks. (Tiddas is a common Aboriginal for sister/s. It also the name of the great Australian Aboriginal women’s band that performed for ten years from 1990-2000, comprised of Lou Bennet Yorta Yorta, Amy Saunders Gunditjmarra and Sally Datsey native born). -that some played two-up with two-headed coins and ran bets on what hymns or psalms would be used on church parades. In this story I have attempted to show the horror of war for what it is. It has been my intent to show the hardship and suffering endured at Gallipoli. I had two uncles there, Stephen Tognolini, Military Medal and Bar, 21st Battalion and Andrew Tognolini, 24th Battalion. They would be joined by their two other brothers John/Jack Tognolini, 57th Battalion Military Medal and Henry/Harry Phillips 60th Battalion on the Western Front in France and Belgium. John/Jack Tognolini was killed in action on 25th April 1918 at the Battle of Villers-Bretonneux in France. The army had his age as 24 years old. As he was born in 1900, he was either 16 or 17. I will be writing three future volumes to Brothers dealing with the Western Front in the years 1916, 1917 and 1918. This photograph is of Sergeant Stephen Tognolini, (back) Military Medal and Bar and Corporal Sergeant Major George Campbell Hunt, (front) Distinguished Conduct Medal, and was taken on June 27th, 1918 in Querrieu, France. It is part of a group photograph of the 21st Battalion’s Non-Commissioned Officers. Both served at Gallipoli. George Campbell Hunt was killed in the Battle of Hamel on July 4th, 1918. A History Man’s Past & Other People’s Stories: A Shared Memoir. Part One: Other People’s Wars is a shared history in many ways. It’s where part of my story reflects the people I’ve interviewed with my media work over thirty years. My interview with retired Australian SAS Warrant Officer Dr Brian Day, who served with the US Special Forces in Vietnam and Cambodia. He was also a founding member of the Australian Vietnam Veterans Association. I interviewed him in 1992 on Anzac, Racism, and the Madness of the Vietnam War. My interview with Stan Goff, a retired US Army Special Forces Master Sergeant and Vietnam Veteran who served in the US Army up until Haiti in 1996. He became involved in Military Families Against War that was formed when George W.Bush invaded Iraq in 2003. My question to Veteran Journalist, Writer and Filmmaker John Pilger, at a public meeting in Katoomba, in the Blue Mountains about history being memory in 2008. My question to Activist, Academic, Writer and Linguist Noam Chomsky, and coverage of his Sydney Press Conference, when he visited Australia in 1995, campaigning for an independent East Timor, then under the murderous Indonesian Occupation. A shared history in another way too, I argue here that Australia’s Frontier Wars against our Indigenous Peoples should be recognised in the Australian War Memorial. I also argue against former prime minister Tony Abbott’s $90 million dollar John Monash Centre at Villers-Bretonneux, France and highlight the $400 million spent on the Centenary of Australia’s involvement in World War One as a major act of hypocrisy, when one in ten of our nation’s homeless are War Veterans. This book is also an attempt to answer that big question, why has Australia been at War so much in so many places normally as junior partner to Britain or the United States? The picture is of the grave of the boy I'm named after, note that word boy, not man John/Jack Tognolini, Military Medal, Killed in Action on 25th April 1918 at the Second Battle of Villers-Bretonneux in France, in World War One. The army had his age as 24 years old. As he was born in 1900 he was either 16 or 17.